I’ve been tracking my spending and budget planning for years now. While I wouldn’t say I’m super thrifty because of it, I’m definitely more mindful of my spending and have built up a decent amount of savings. If you’ve been reading my blog a while, you’ll know I’ve posted before about my budget planning set up in my Filofax. I also gave an update a year later. Since then, I haven’t changed my system too much. That was until, I started using a Hobonichi. Well, two Hobonichis. The more I’ve used my Hobonichi, the more things I’ve moved over from my Filofax to my Hobonichi. 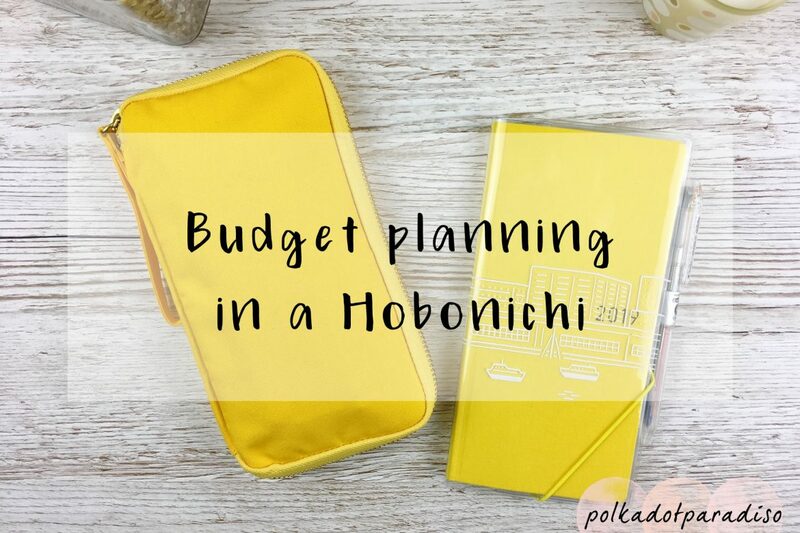 The latest thing is budget planning..
Before I get into exactly how I use both my Hobonichi Weeks and Cousin to budget plan, it’s a good idea to take you through how I set up my budget each month. While the planners I use and how I write everything out might change, this process always stays the same. What is your income each month? This will differ from person to person. Those who have a more static income, this will be much easier. Those who are self employed you’ll have to do some maths and work out some conservative averages. As I have a mix of the two, I use my salary as the starting point. Anything I earn from Etsy over the month, I add onto at the end of the month (more on that later) but consider it a bonus. What are your static outgoings each month? This is your direct debits and amounts that don’t change – rent, phone, internet etc. I don’t include bills such as gas and electric in this as they change from quarter to quarter. Whatever is left is your budget for the month, for you to portion out however you want. Create budgets for each category. I have four categories – food, petrol, Etsy (shop related expenses) and other (everything else). I set a budget based on what I have left after bills for each of the four categories. Whatever is planned to be left over, is intended for my savings. At this point I also consult my planner for the month. If I have more trips or birthdays, I may need to designate more money for food or other. If I know bills are due this month, then I need to reduce everything by a little bit to pay for them. To aid with the above, I’ve changed where I write my budget each month. Instead of having it in a separate section somewhere, like I did in my Filofax, I now put it in the monthly view in my Cousin. What I do have separate, is a page in the back of my Weeks for my static outgoings. I have a list of all the outgoings (gym, rent, car payments etc). This means that in my monthly view, I only have to write out the total planned outgoings for the month, which takes up much less room. Alongside that, I have my salary for the month and space to write in my Etsy payments each. If I know I’m going to be claiming expenses through work, or I have other income due then I leave space to write that in too. Underneath all that is where I write my self imposed budgets for my four categories. Other than writing in my Etsy payments, this remains untouched until the end of the month. As my Weeks is my everyday carry I find using this to track my spending the most foolproof way of doing it. This means I have no excuse not to write what I spend as I’m actually out doing it. I have a very simple set up, using the notes pages in the back. I have a chart where I write the date, what I’ve purchased, the amount and a column to tick or mark which category it falls into. For next month I haven’t given petrol it’s own column as it takes up a lot of space for something I’ll probably only do once in the month. To make it even easier to count up spending in each category, I’ll also colour code as I go. Speaking of counting up the spending, on the left hand size you’ll see weeks one to four written out. This is a new idea given to me on a Facebook group. Each Sunday evening I’ll total up the spending in each of the categories and write it in. It’ll make keeping myself on track budget-wise much easier. Before, I was just ad-hoc counting it up throughout the month, to check in on where I was at with my budget. What I may do at the end of each week is also write how much is left of each budget as a very clear written reminder. This will be particularly useful if I’m halfway through the month and close to hitting a budget! I don’t do my budget by calendar month as I get paid on the 28th. Therefore when I say end of the month, I mean pay day. At the next pay day, I sit down and review my spending for the previous month. I’ll add up all the outgoings and enter them in the monthly view. I’ll then add up the total income I ended up on for the month. From there I’ll work out how I ended up for the month – either plus or minus. I’ll then check my bank account balance to see if it actually matches up (it often doesn’t, usually because of a pay after delivery on Paypal that I’ve forgotten about). Whatever is leftover at the end, goes into my savings. When I first started budget planning I was terrible at it. I had no awareness of how much money I was really spending before I started doing it. The first month the budget I set for food ended up being about 50% less than what I actually spent! However, the longer I’ve gone on, I’ve got the spending amounts down and budgeting much more accurate. Using Apple Pay strangely has helped loads with this too. Now I don’t have to worry about receipts getting lost and forgetting to write the amounts down before that happens. Now I just go into my notifications on my phone and easily see where I’ve spent money each day. Do you budget plan? I’d love to know how in the comments! Also, if you have any improvements to my system, I’d love to hear them!